If saving time and convenience are priorities in your kitchen, why not go hands-free? GROHE’s new FootControl faucets can be turned on and off with a gentle tap of your foot on the base unit, leaving your hands free and your faucet spotless at all times. Two of our most popular faucets now utilize our innovative FootControl technology, but you can also convert any existing GROHE pull-out or pull-down kitchen faucet into a hands-free model with our retro-fit set. So wave goodbye to germs, mess and hassle...with your feet! Get the most out of your kitchen with a tap of your foot! 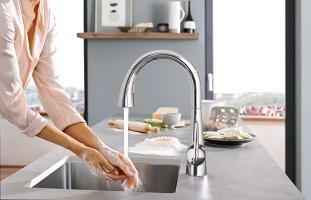 Messy or full hands may be a given in busy kitchens, but the GROHE LadyLux FootControl allows you to operate your faucet without using your hands at all, keeping your faucet sparkling and germ-free. 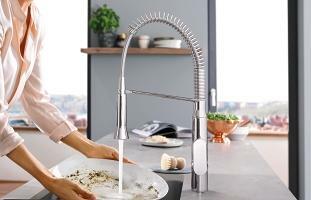 Simply tap the kitchen base unit with your foot to start the flow of water and tap it again to stop. 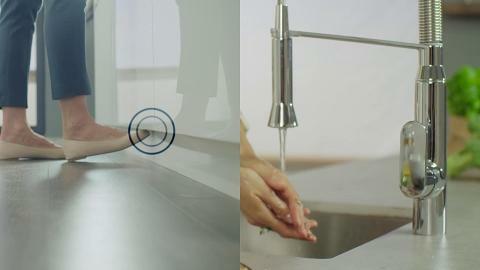 It’s easy, convenient, hygienic and leaves your hands free for other tasks. Take charge in your kitchen with the new LadyLux FootControl, and have the world at your feet.